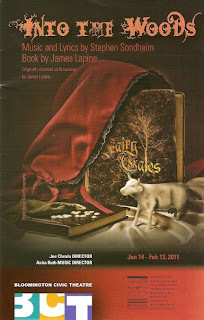 Into the Woods at the Bloomington Civic Theatre was the first show on my list of productions I wanted to see this year. There are two reasons I wanted to see it: 1) my New Years' resolution to see more Sondheim; and 2) I've been hearing good things about BCT lately, particularly in the bios of some of my favorite new actors, so I was curious to check it out. I was not disappointed on either count. As music director Anita Ruth pointed out before the show, Into the Woods is one of Sondheim's happier musicals, and this company of actors, musicians, and designers did a wonderful job with it. There was a "talk back" after the show (love that!) where Anita and most of the actors came out on stage to discuss this show and the theatre in general. BCT program director Bonnie Erickson was also available to answer questions. Most of the actors have "day jobs," which makes their fine work with this challenging piece all the more impressive. I hope to see some of them again, either on the BCT stage or on professional stages in the area. Anita and Bonnie talked a little about the challenges of programming a season of musicals, balancing classic, familiar pieces that a portion of the audience wants, with more innovative and original pieces that appeal to another part of the audience (like me!). It was interesting to hear about the life of this theatre and the work that they do. Into the Woods, featuring music and lyrics by Stephen Sondheim and book by James Lapine, was first produced in 1986. The plot is a mash-up of several well-known fairy tales, including Little Red Riding Hood, Cinderella, Jack and the Beanstalk, and Rapunzel, as well as an original story about a baker and his wife who want to have children but are cursed by a witch. 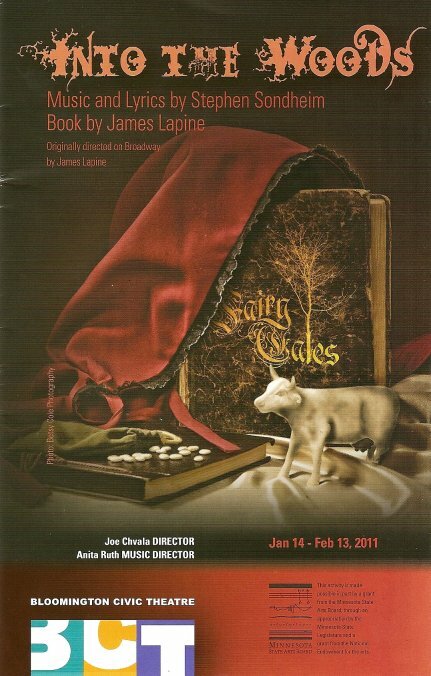 In the first act, the baker and his wife go on a quest to have the spell reversed and intersect with the tales of the other characters, all of whom go "Into the Woods" to begin their journey. By intermission, everyone seems to have gotten what they wanted, but the second acts delves into what happens after the "happily ever after." Sometimes the consequences of getting what you wanted are not all good. As Glinda says in Wicked, "Getting your dreams, as strange as it seems, is a little, well, complicated." The music is typical Sondheim: unusual and beautiful melodies with clever and fast-paced lyrics. Highlights in the cast include Karen Weber as the witch, who later has her youth and beauty restored but her power taken away (you can't have everything). She gets to sing the most well-known song, "No One is Alone," and does so beautifully. Adam Qualls as the baker duets with the witch on that song, and is quite charismatic and natural on stage. Colleen Somerville is his equal partner and wife, until she's charmed by the prince in the woods. Laurel Armstrong is the Cinderella who comes to realize the fairy tale prince may not be the answer to her dreams after all. Aleks Knezevich and Eric Heimsoth are the charming princes in "Agony" who, once they find their princesses, are not entirely satisfied. Courtney Miner is a spitfire of a Red Riding Hood, and Joshua Hinck sings beautifully as the addle-brained Jack whose best friend is a cow, and who sets off a chain of events he didn't see coming. The set was colorful and whimsical with moving pieces that functioned as beds, rocks, or trees depending on the scene. Now that I've discovered BCT I'll definitely be keeping on eye on their schedule. Their next show is the Cole Porter musical Kiss Me, Kate this spring, which might also be worth checking out. I was very impressed with the all-around quality of the show and am glad to add BCT to my rotation of theaters.